Reboring your existing rifle barrel is an economical way to get a high quality barrel. The only acceptable process of re-rifling a barrel is to cut the rifling, button rifling will not work on tapered barrels. Cut rifling has been around for years and is a proven method of producing highly accurate barrels. We will rebore rifle barrels that are 18 inches or longer. Minimum muzzle diameter for rebores up to .375 is .550. We do not rebore double rifles. New custom cut rifled barrels are available. The following lists our rebore calibers. Relining is available for low pressure cartridges. We make step liners for tapered barrels that require reduced outside diameter at the muzzle. 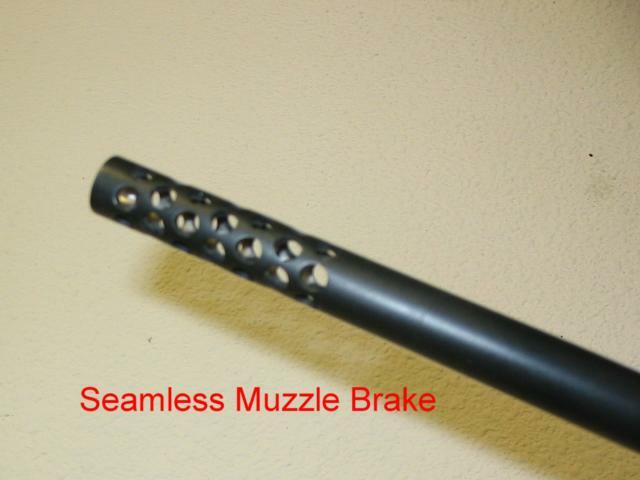 We can install a muzzle brake for you that appears seamless. The gas holes in the muzzle brake have a 7 degree forward pitch which takes noise away from the shooter. The brakes are contoured to the taper of the barrel and when finished the brake is indistinguishable from the end of the barrel.